I know people have different opinions on this, so I'm hoping to hear some. Personally, I don't feel I can call myself a writer until I'm published. Just as I wouldn't call myself an electrician if it wasn't my job. I feel like if one defines oneself as "a something" that means its the person's main occupation or at least a very large part of what they do. I wouldn't say I'm "a painter" unless I did little else. I would lean more toward saying "I write" or "my hobby is writing" or even "I want to be a writer." Then again, there are some people who write very well but will never pursue being published. Seems like they should be called writers just as much as someone who is published. Where do you think the line should be drawn? Is it about skill, occupation, prolificacy? Should there be a line or is it up to personal preference? Short answer: I don't really care. If someone wants to call themselves a writer, they're welcome to, though I reserve the right to tell them if what they write is rubbish. Longer answer: depends on the context and any qualifying adjectives; for example, someone could be a professional writer, an amateur writer, etc. Ultimately, labels matter less than the quality of what someone does, whether they do it professionally, as a hobby or somewhere in between. After all, there are plenty of professional writers who are awful and plenty of amateur writers who are better than them. And the term 'professional writer' is itself ambiguous - do the people who pay to have their X hundred pages of tripe spat out by a vanity press qualify? Even shorter answer: don't worry about it too much. - that I'm getting paid for it (at least some of it, anyway). I think in my mind, being able to assume the title of writer implies some kind of professional level of engagement, hence the conditions. At the moment, I write, and I like to write, but I'm not doing it to survive so I'm not a writer. I've just read two LJ posts on the subject by Lili Saintcrow (here and here), which is what got me started on thinking in this particular direction. I don't know if I totally agree with her assertion that you have to write every day. You just can't apply a rule like that to everyone - not everyone works in the same way. However I do agree with the bigger picture version of that idea, which is that, in order to get anywhere with writing, you have to give it a significant place in your life in terms of priority and time spent on it. Flippancy and NeilGaimanosity aside, those photos show A Writer At Work, IMO. 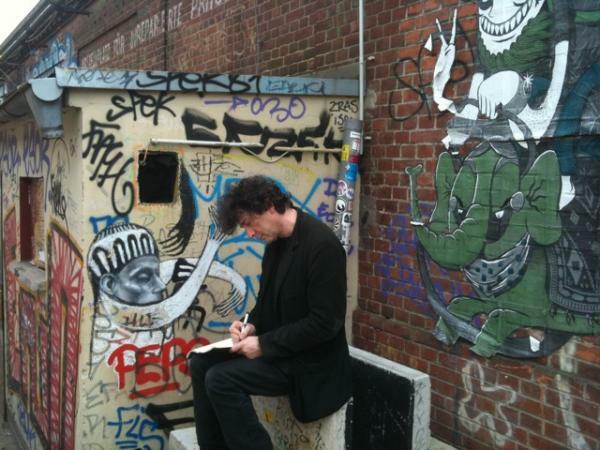 I've always liked that he seems to be able to write any time, anywhere. I aspire to that (I already have the hair ). Why should something - writing, singing, art of any kind - have make money for you in order to be part of your identity? My mother, for example, is a cake decorator: it's what you might call a "hobby business", in that it brings in enough to cover its own expenses and sometimes more - but it doesn't take up her working days or even a large percentage of her time (except for the weeks before a cake is due). I would also say she is - or was, perhaps, since she doesn't sew much - a sewer, in that sewing used to be a major creative and practical focus of her time. Plenty of people are acknowledged to be knitters and make no money from it. That is a really good and really awkward question. I'm going to have to give that some serious thought. Niamh, have you ever had cause to look at Joanna Russ's How to suppress women's writing? I'll admit I haven't read the whole thing, but it's a very sharp look at the way we think about what constitutes A Writer - and the gendered way we apply that understanding. I don't think much has changed on that front since the book was published, either. No, I haven't read that yet. I'll put it on my list - it looks like a good read! I went to the author's note, and you know what struck me? The VERY FIRST THING she does is apologise for her writing. I wonder if she noticed? Also, on the topic of the commercialised concept of "writer", there was a bit of a scuffle went down on my flist the other day on that topic - someone found a story implausible because the two protagonists were constructed as poets while being primarily employed in other industries (one a teacher and one, I think, some kind of tradesman). The person whose LJ I saw this in brought up the fact that "author" as a profession is a relatively modern concept - many if not most authors until the last hundred years or so were supported by something other than their writing. If writing was their sole occupation, a writer usually had to be independently wealthy - which makes sense, if you think about it, because until the Victorian era there was no universal education, and without universal literacy, your market for popular fiction is limited. Chaucer? Various jobs, including civil servant and diplomat. John Donne? Politician (which, interestingly, was an unpaid job), and later an Anglican priest. Shakespeare? We remember him as a playwright, but the man's job was as actor and director/producer and theatre owner. Milton? Also a civil servant. Before you think that you have to give up your day job to be a Real Writer, remember Shakespeare! Ah, but all the examples I cited were Recognised and Circulated in their day! Can you be a Writer if you're not earning great critical acclaim? Consider Van Gogh. As those of us who watch Dr Who know, good old Vincent sold exactly one painting while alive. You'd have to be nuts to say that Vincent Van Gough was not an Artist. Granted, many people paint works, write fiction, compose songs which are terrible, or mediocre, or just OK, and will never elevate them to the sort of posthumous status that Van Gogh merits, but some people may. Some people may deserve recognition which they never get - I'd be wary of measuring the value of a creative act by it's public status. All of this is a long way to say i agree with Keith: anyone can call themselves a writer; I reserve the right to call them a [i]bad[/b] writer. I'll start with Stephanie Meyer, an author whose writing is her full-time, very lucrative job. It's also terrible. Hmm, I mostly agree with you highly. But I think another thing to consider is that while historically writers main occupations were something other than writing - these days it seems most people who would be referred to as 'writers' do it as their sole occupation. So if I call myself a writer today, it seems like I'm making a claim that I do it at least semi-professionally. At least, that's what I'd assume about a person who says 'I'm a writer' - I'd think they are saying they are published or are working on getting published. Possibly the public's idea of 'writer' has changed since Shakespeare's time? I think the public idea of what is a Writer has changed, yes. But I don't like the fact that that idea focuses so heavily on "work" and capital gain. I'm really excited about Extribulum Press, for example: a self-publishing process set up by a fellow who goes under the blog name of Sam Starbuck. He's a good writer- a *very* good writer, if you ask me; but rather than seeking an agent and pitching to publishers via the "normal" route, he's chosen to publish drafts on his blog, have his readers give feedback and serve as a crowdsourced "editor"; and then he finalises the draft himself and publishes through Lulu. He's won some blogging awards lately, and out of the publicity from that, been approached by a YA publisher who *specifically requested* that he pitch a novel to them. He's following up on that, so, yay, commercial validation -but he believes in extribulum, its place in the online community and as an alternative to mainstream publishing. I'm still not sure what he'll ever make out of it, but he has plans to include other authors in the process (and several other writers *want* to be involved), and... yeah, I'm excited to see what comes of this. Well, this is an interesting discussion. I've posted a story in the fanfiction section, and I write fanfiction a lot. I write at least one chapter every day, as a rule, sometimes more, though there are days when I don't. I heard somewhere that "A writer writes," so that qualifies me as a writer right there. I've got stuff in for consideration with a publisher, and I post blogs and other stuff on the archives and e-spaces that I own, so even though I'm not being paid for it, I can say I'm published. Besides, publishing is about circulating your stuff, and I have. If I get paid by the Adsense people, does that count? I don't suppose my historical article that ended up in the local paper counts. I was 14 at the time. As Highly pointed out, if you do stuff often, you can define yourself as being that thing. I write pretty much all the time -- ATM, I'm working on an original novel that's posted on my archive site, The Legend of Lorcan. Like the person mentioned by Highly, the idea is to get crit from my readers before I send it off for consideration by Lyrical Press. Or Lulu. The point is, I've always thought of myself as being a writer, since that's what I spend most of my time doing. That's something I learned during WriSoMiFu last year - I'm a decent creative writer, and often I feel like I've sold out by focusing on academic endeavour over creative. I don't have the emotional investment to sustain long-form creative fiction AND non-fiction at once, and for some reason I can't write poetry while I'm studying. During WriSoMiFu, someone asked "what sort of writing inspires you", and I had a *facepalm* moment, because the things I really love to read aren't fiction at all - they're all analytical non-fiction. So, er, now I'm procrastinating and not actually writing my thesis, but when I DO, I get to point at it and say "see? I'm a writer of STUFF!" What about people who post in online archives? We've got one, now. It's linked on the top menu. I'd love to see more stuff in there... some of you are brilliant! Hmm, I draw the line between writer and author, author being the published sort of writer? I think. That is just what i came up with right now. I've been writing, or at least storytelling, longer than i can really remember. My the logic that it needs to be a career, then by extention am i not a gamer? I hope not! Strictly speaking, the words are interchangeable. An author is basically a creator. It doesn't have to be writing. "The author of my success..."